Degree of Freedom project: Earning a one-year B.A. through MOOCs. Lessons learned from earning the equivalent of a B.A. in 12 months, online. I walked into the evening cocktail hour at the recent American Philosophical Association (APA) Eastern Division Meeting even more self-conscious than the job-hunting graduate students nervously prowling the halls. For they at least had Ph.D.s, while my philosophical training consisted of just one year of intense study—study conducted entirely online, facilitated by massive open online courses (MOOCs) and other forms of free learning. I was attending APA as the self-assigned “final exam” for my Degree of Freedom One Year BA project, an experiment designed to determine whether it was possible to learn the equivalent of a four-year liberal arts bachelor’s program in just 12 months using the online classes that have been in the news so much over the last two years. In fact, it was those very news stories that inspired my project. For in 2012, declared the “Year of the MOOC” by the New York Times, enthusiasm for massive open courses was running high. MOOC boosters (from Thomas Friedman to Udacity Founder Sebastian Thrun) were talking about an academy about to be disrupted to its foundations. And elected officials in California and Florida answered by introducing legislation that would give college credit to students taking them. By the end of my “sophomore year,” in June of 2013, however, a MOOC backlash had set in, with educators questioning the value of a teaching method where less than one in 10 of those who enroll complete a course. Legislation that proposed granting credit for MOOCs was shelved or watered down amid complaints that MOOCs (many offered by venture-backed companies) might decimate the educational landscape in order to turn a profit for investors. These critics had something in common with earlier enthusiasts: little to no experience taking actual MOOC classes. That was why the voice I wanted to add to the conversation was that of a student—one who had completed the number of courses required to meet the distribution and degree requirements of a traditional liberal arts B.A. program. I have always been a recreational learner whose interest in college-level courses was not sated when I earned a B.A. from Wesleyan in the 1980s. And while that degree was in chemistry, recent self-education (using podcasts and iTunes U lectures) pulled toward history and humanities. So when it came time to pick a major for my One Year BA, I chose philosophy. It took a while to get into the rhythm of juggling eight classes every three months (many from the “Big Three”—Coursera, edX and Udacity—but also lesser-known free-learning providers like Canvas, NovoEd, Open Yale, and the Saylor Foundation) and blogging about the experience daily. In May of 2013 I added a weekly podcast interview series to the mix that let me share what students, professors and entrepreneurs involved with different aspects of the MOOC movement had to say about an educational phenomenon playing out in real time. So what did I learn from this experience (beyond some Kant and Heidegger)? To begin with, all the professors I studied with over the last year took their courses and their unseen students seriously, treating us as eager and grown-up learners ready to grapple with complex ideas, often from novel perspectives. 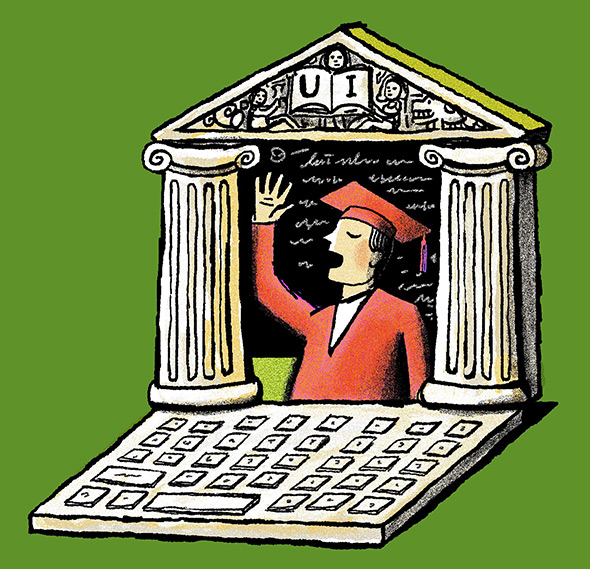 MOOCs are often criticized for just transferring a “sage on stage” pedagogy from the lectern to the computer screen, scaling up the worst aspects of oversized lecture classes. But as my year of MOOCs went on, I saw a new visual language developing, as single talking heads were supplemented (or replaced entirely) with conversations among colleagues (the visual style of one of my favorite courses: HarvardX’s Ancient Greek Hero), interviews with experts, on-location shots, and even on-screen performances. Such creativity helped to make lectures one of the most engaging and, ironically, intimate components of massive online courses, while also raising the bar for all other forms of online learning (most of it far duller than your average MOOC). The total volume of work I had to do during my One Year BA, while extensive, was certainly less than what was demanded of me over the course of four years when I earned my original degree. And attempts to engage with fellow students via forums or attempted meet-ups generally fell flat (in part because the speed at which I was working left little time for community building). That said, I will always remember how a question I posted in the Greek Hero forum regarding the portrayal of Achilles in Troilus and Cressida was answered by a fellow student who knew exactly which classical sources Shakespeare had at hand when he wrote that work. So while online classes do not facilitate the back-and-forth of an undergraduate bull session, they do offer the chance to interact with other students with a wide variety of life and academic experience, some of it quite useful. Calling out MOOCs for being easy to pass might seem strange, given how much they are criticized for their alleged huge dropout rates. But, as data that became available during my year of online learning and research demonstrated, the numbers we have been using to evaluate the success or failure of MOOCs (including huge enrollments and high dropout percentages) are shallow at best, misleading at worst. For students hitting the Enroll button on the Coursera or edX website do so with different goals in mind—ranging from simply wanting to browse a syllabus, to auditing, to earning a certificate. (Or simple curiosity—edX daily enrollments tripled when the organization’s president appeared on The Colbert Report, for instance.) So treating every enrollee as the equivalent of a student completing or dropping out of a course at a residential university means we are using the wrong metaphor to ascertain success and failure. And speaking of success and failure, how did I do on my “final exam”? Given that my threshold for passing was not feeling like an idiot at the half-dozen APA sessions I attended, then I passed with flying colors. I was easily able to follow talks about a range of philosophical subjects (some of which I had studied last year, but some I had not), and even managed to find the courage to ask a question regarding a potential solution to “The Trolley Problem”—a vexing moral thought experiment I was introduced to in my HarvardX Justice class—that wasn’t slapped down by the speaker. No doubt any of the Ph.D.s in the building could have chewed me up and spit me out had I overreached, just as easily as they could drink me under the table at cocktail hour. But my One Year BA was not meant to turn me into their peer. Rather, it was meant to create the type of transformative educational experience one receives at the undergraduate level, one that leaves you a different person at the end of it than you were when you started. With that in mind, is it outlandish to consider me the equivalent of a graduating senior with a B.A. in philosophy? As Socrates, one of my guides over the last year, put it, “Education is the kindling of a flame, not the filling of a vessel.” And in a world where traditional education is costing ever more, and seems often to seek to fill rather than kindle, the free-learning bounty growing and improving online might yet prove a valuable resource to turn young people into passionate independent learners.